HAUGHTON, LA (WVUE) - The tiny northwest Louisiana town of Haughton is an unlikely place to see a massive collection of wild animals from around the world. But years ago, a husband and wife team turned their taxidermy skills into the creation of a homemade natural history museum. These aren't the kinds of animals that typically end up in your local taxidermy shop. But Lura Touchstone and her late husband Sam got obsessed with the idea of creating their own wild animal museum in the northwest Louisiana town of Haughton. "I was working for my husband doing taxidermy learning it," says Touchstone. "He taught me everything about it. And uh, we decided to build a museum." 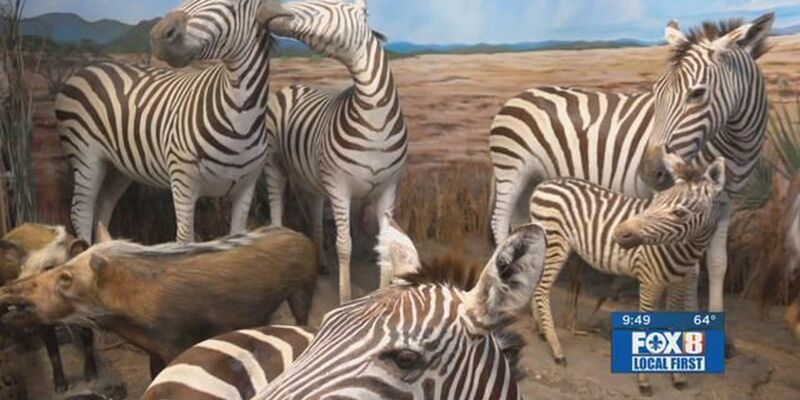 They realized their dream more than 30 years ago as they filled diorama after diorama with stuffed animals that came from the plains of Africa, the jungle, the American West and even the Arctic. "Put some in the ceiling, ran out of room. And then we just kept day after day, you know, putting more in until we just had upstairs and downstairs full." Although Lura Touchstone still hunts, mostly for deer, the bulk of these animals died in zoos. "They had it frozen so we'd put it in a van and bring it back. Then we have to thaw it out, skin it out and then decide what form we're going to put it on. How we wanted to position it." The animals range from reptiles to birds. And all sizes and shapes of mammals. The collection numbers more than a thousand. One of the most impressive pieces, and certainly the tallest, is the 23-foot high giraffe that Lura and her husband brought back from Africa. "We had to put scaffolding around the giraffe to get up there and work on it. I liked the zebras and I let people go in there and take pictures. Well, we have stallions and we have a female zebra." The background blends with the animals which are grouped together geographically and displayed in natural poses. "You've got to put all the expression, their eyes, ears, nose and pull the skin around and place where it looks natural." Over the years, the Touchstone wild animal museum has been popular with school groups and families. "It's educational and they learn about the animals." It's a lifetime of collecting hard work. A real labor of love that provides an in-your-face look at the wilder side of the animal kingdom. Touchstone Wildlife Museum is located about 10 miles east of Shreveport. For information, visit www.touchstonemuseum.com.